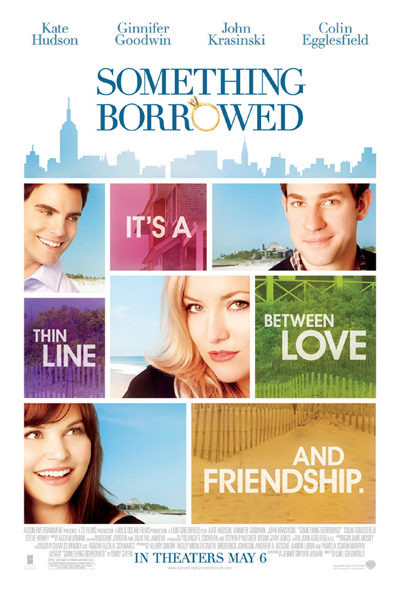 From IMDb: Friendships are tested and secrets come to the surface when terminally single Rachel falls for Dex, her best friend Darcy's fiancé. I had already read the book by Emily Giffin when I watched it so I knew (most of) what was going to happen. However, I still really liked the movie! Not just your average chick flick. Whether or not you've read the book, you should definitely check this movie out! Come on, it's Kate Hudson and John Krasinski! Having already read the book, I didn't know what to expect but I still really wanted to watch it. If you haven't read the book, I'd really recommend it. It's such an amazing book! I couldn't put it down (as some of you know if you read my book review). In the book, Rachel (Ginnifer Goodwin) is supposed to be a not-so-attractive woman (or as she claims) and Darcy (Kate Hudson) is supposed to be BEYOND gorgeous however, I didn't get that from the movie. Maybe it's because the movie, like the book, is from Rachel's point of view and forces you to be on her side but I thought Rachel was more beautiful than Darcy. I think it's also because of the selfishness and obnoxiousness Darcy pulls that makes her that much more less attractive. I'm quite excited to read "Something Blue" (maybe there will be a movie sequel?) to see Darcy's point of view. Ethan (John Krasinski) didn't really play that big of a role in the book. He was only "partially" there because he lived in London the whole time and all Rachel did was talk to him via phone/email about her relationship issues. The only really accurate part was her visiting him in London. Having said that, I absolutely LOVED Ethan's role in the movie. The scene where Rachel and Dex are in the kitchen in the Hamptons, Ethan walks in and says hi, what's up but they both, without saying anything, walk away from him. I laughed SO hard at that. John Krasinski is just amazing as an actor and played Ethan's role so well. Also the ending wasn't anything I expected because in the book, Darcy spots his watch which is quite subtle and is in the room the whole time when she discovers it. However, in the movie they made it more obvious because Darcy spots his jacket instead of his watch. I remember watching Darcy walk out and be like "phew..." even though I KNEW she was going to find out. The surprising moment is when she walks out then back in and asks Rachel what Dex's jacket is doing in her apartment. I liked that the movie's ending was a bit different because people who already have read the book won't see the storm that's coming. I don't have much to say about Dex (Colin Egglesfield). Everyone has their own version of a gorgeous and handsome guy but this guy was pretty close! I will say that everything in the movie happened so fast that people would assume he's playing Rachel but in the book, readers are able to understand their relationship a bit better. And as usual, Kate Hudson played Darcy's character perfectly, I don't think I can see anyone else fitting into her shoes. So basically, I loved the book. I loved the movie for staying somewhat true to the book and having its own unique moments.